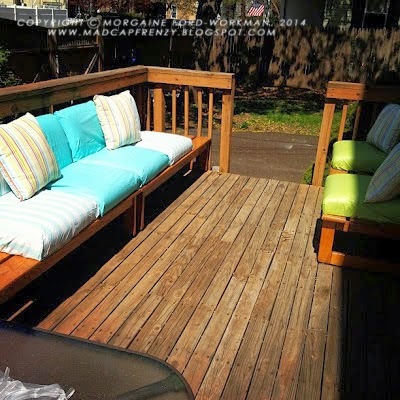 Madcap Frenzy: graphic design, DIY and everything in-between: A colorful deck seating area makeover: Bring on the Spring! 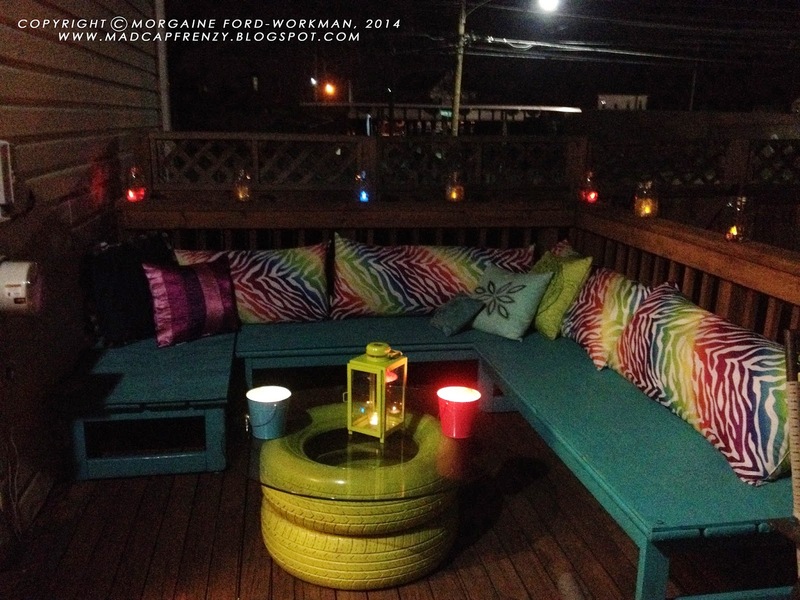 A colorful deck seating area makeover: Bring on the Spring! This past weekend, not only did we have the grand reveal of our Barshed (which was mostly my husband's brainchild), but I also unveiled my bright updated deck seating area. I was determined to make this space as bright and cheerful as humanly possible, since out backyard isn't the most glorious spot. I just can't wait till the spring and summertime is in full swing, so I can hang out here a lot more. The only thing I still haven't done is put up the sunshade we have planned over the benches corner- but I'm waiting for the winter to be officially over before we go through the effort of putting that up. Then with some bad weather that summer/fall, the cushions started to get mold inside and the tops started to peal. 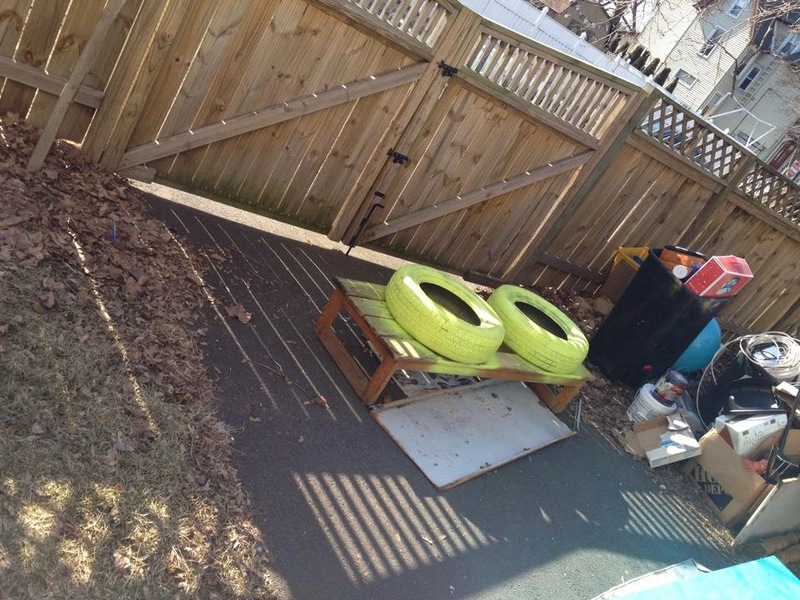 This past winter, I had to throw away the seats, as at that point there was no saving them. So I thought to myself "How can we still have these benches used, but without the seats?" We decided to pick up some plywood sheets, cut them to size and attached them overtop of the benches. I then spray painted them the brightest color I could find- Seaside teal blue. For the 3 benches, I used 3 1/2 cans of spray paint. I also was on the hunt for cushions. After much research, I was dismayed by how freak'n expensive bench cushions are! One evening earlier this month I wandering around Wal-mart for some hope of finding something to make the cushions out of and I came across an end bin filled with these adorable body pillows. 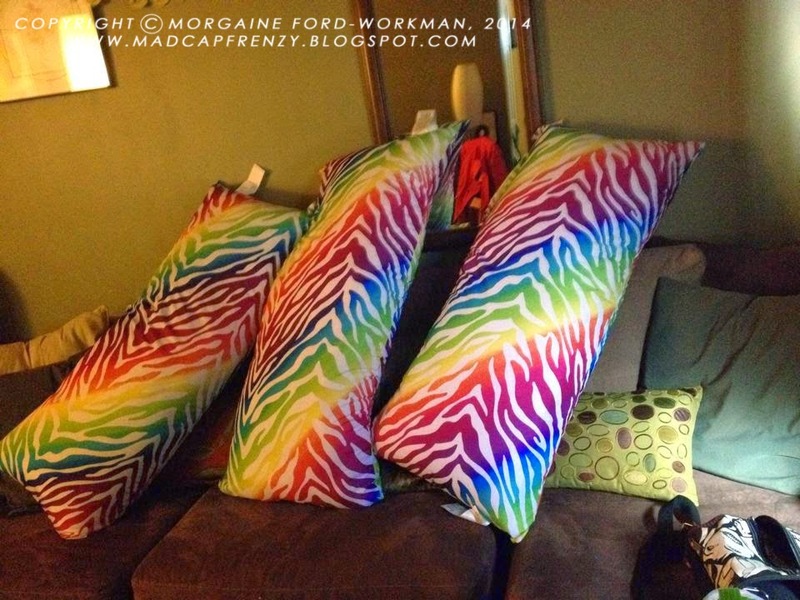 *lightbulb moment* I just will use these as back cushions and it will bring in the bright colors! At first I snapped up 3 pillows (I thought "we have 3 benches, that should be enough right?) at $8.88 a piece. After getting home and testing them out on the benches (in the dark, mind you) I noticed I really needed 1 more pillow. Oh no! I need more pillows! I then was on the hunt for the throw pillows- I refused to pay more than $5 a piece, which even Wal-mart didn't have that cheap in bright colors. I already had the large teal pillow (far left), but I knew I wanted a few more. After a trip to my trusty Salvation Army, I found exactly what I needed- more bright throw pillows- ranging from $2-4 each. Earlier this year my car needed 2 tires replaced. Knowing that they charge you to dispose of them, I asked our mechanic to just stick them in my car, as "I'm going to use them as planters." I was determined to save money and use these tires for SOMETHING. After seeing numerous ways to use tires as furniture or planters on Pinterest, I got the idea to make it into a coffee table for the deck. We had this round piece of glass leftover from an old coffee table the hubs picked up (which I thought was hideous, but refused to get rid of the glass portion as "we can at least use that.") We first used the glass in our 80s party decor (putting it over our round dining room table with Christmas lights under it) however it was slightly too small to keep on our dining room table all the time. spray painting the tires (they rested on the spare bench we had- that was in the worst shape of the bunch). So after spray-painting the tires with my favorite Key Lime green/yellow color spray paint (which I painted our kitchen breakfast nook chairs with), I stuck the glass on top of the tire stack and tada- instant table! Eventually I might put something inside the tires- Lights, sparkle, flowers or something. But for now, it works. I finished off the table with some Dollar store bright finds. The rest of the deck includes our classic patio furniture with umbrella. I set the table with some cheerful place settings, to enjoy some soup and bread eventually. And for the little nook left on the deck, I setup 2 of my soda fountain chairs on either side of a spare tv table I have (I'm debating over painting it a bright color as well eventually). 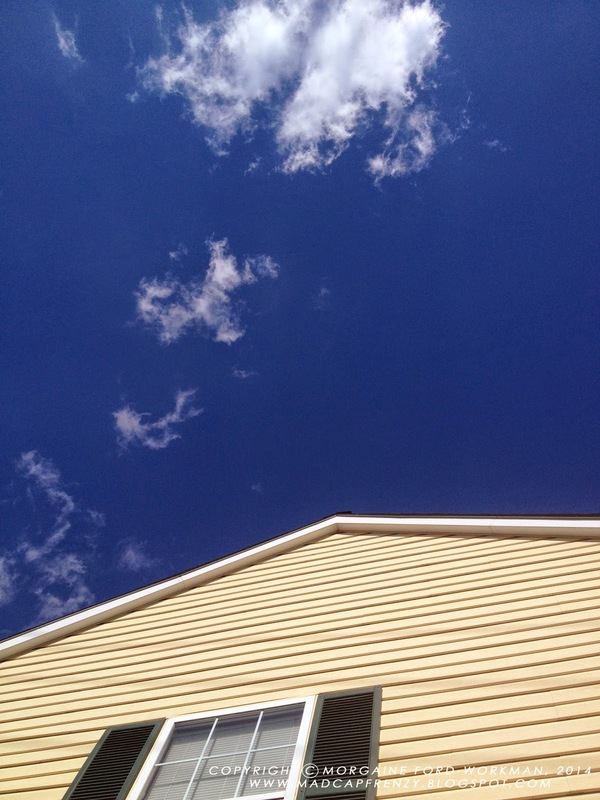 Did I mention how lovely a day it was on Saturday? 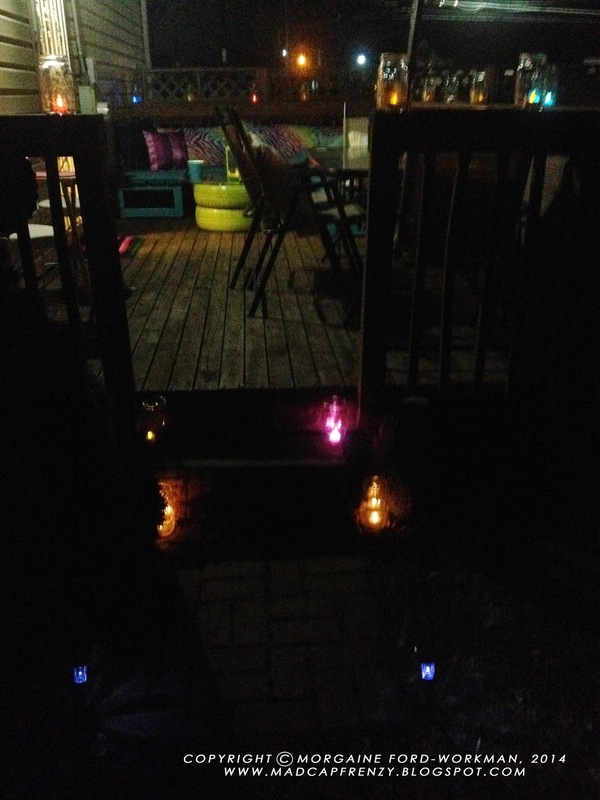 Even at night, the space is fun- I set up mason jars with LED tea lights all around the deck, besides the actual candles. I just can't wait to hangout here more! It wasn't that difficult of a project, and if you have the right materials, I bet ya'll could do it too! Have a great day everyone and with tomorrow being the first day of Spring I have my *fingers crossed* the weather gets warmer! I love this! I'm a big fan of bright colors, especially when it comes to exterior decor. They're so lively and fun. And that tire table is such a great idea. I love it all! glad you came by my blog. Happy spring! This is so nice! 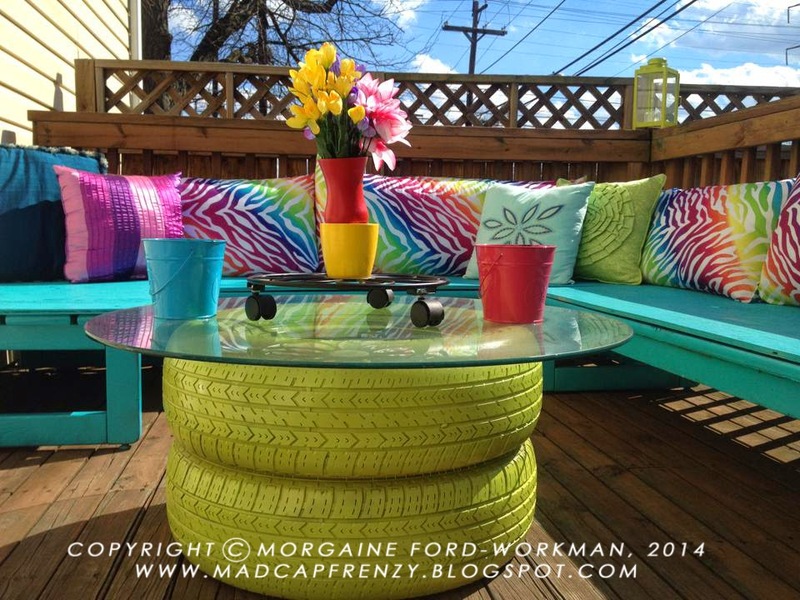 I love all the bright, fun colors and your tire table is such a great idea!! thanks for stopping by. Check you're blog out now too! what a totally awesome space! i looove the colors, and the lounging that clearly happens on those benches and the TIRE table! thanks! It is actually quite a comfortable lounge spot. lol. I love how the tire table turned out, to be honest! You've really done a lot to make the most of a small area, I totally makes me want to come over and enjoy all that color! thanks! I can't wait for the spring/summer to be in full swing! Beautiful! 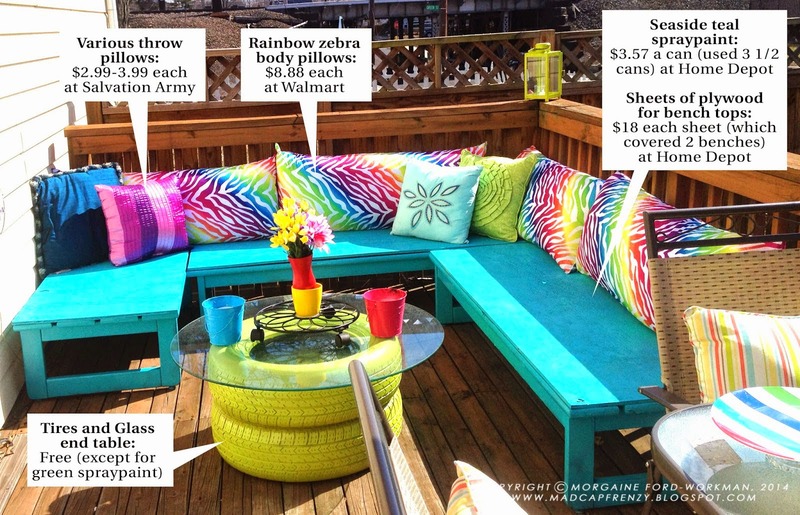 I love those rainbow zebra cushions. who knew that Wal-mart pillows would be so cute!? Stopping by from the DIY Sunday Showcase and LOVING this project! I've been wanting to spruce up my screened porch but completely lacked inspiration,,,until now! The bright colors are so cheerful. Your deck looks like a place I'd love to spend all summer on! Enjoy! Thanks for stopping by! Glad you found me from the showcase. Believe me, I can't wait for the summer either. Love the colors and the tire coffee table is totally awesome! Thanks for linking up at the Sunday Showcase Party. I've pinned it to our DIY Sunday Showcase Board as well! Thanks so much! I will certainly get your button! This is soo cute, bright and fun!! Thanks for sharing this on DIY Sunday Showcase!! I'm pinning this one!! Thanks for stopping by from the showcase! I love everything! It all looks so festive, happy and welcoming. Great job! Thanks for joining the Say G'day Saturday link up. I've just pinned this and shared on Google+. Thanks! I had fun joining the link up. I'll have to join up next week. This is fabulous! One question... did you have to clean/prep the tires before painting? What brand/type of paint did you use? As far as cleaning- I just made sure the tires were free of rocks/dirt/grass stuck in between (as good as I could) and made sure the tires were dry. 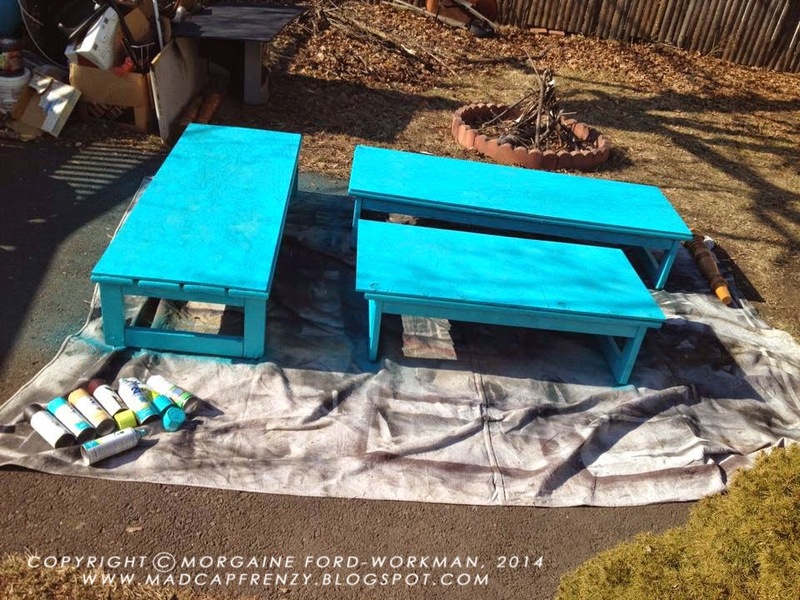 For paint-I used Rustoleum Outdoor Lime Green spray paint. The table, though outdoors, spends most time under a sunshade and the glass covers the top of the tires- so it hasn't shown much weathering (unlike my firepit chairs which are peeling already)- that being said- You could put a clear coat of outdoor sealent if you are afraid of weathering. I really liked the idea of ​​the table with the tires :) I'd love to understand from you what you used to catch the glass for tires to be stable? Right now I don't have anything- the glass just sits on top, but the rubber tires holds it pretty tight- it doesn't move at all. I just don't have people sit on it. It's used more as an end table/coffee table, so I don't ever have very heavy things on it, though I have had many plates of food during our 4th of July bbq and it never once budged. I think the rubber of the tires, keeps it stuck. I can picture some battery operated Christmas lights (the clear ones) inside the tire table. That would make for some beautiful up-lighting in the evenings. how do you keep tires together? love it,but that glass topped table and the thing with castors on top wouldn't last 2 seconds in Oklahoma,unfortunately. Hi - Can I use the Picture of your great table of tires? I will of course link directly to your site form the pic. I am writing for a danish website for houseowners (www.bolius.dk), and right now I am working on an article about recyceling tires – and I stumpled over your fantastic blog. no problemo! Just link directly to my blog. Thanks! Hi Morgaine! Your deck is too cute! This is Pili from the blog My Sweet Things and I'm planning to do a round up post about recycling tires and liked what you did so much! I wanted to ask you permission to use one photo and a link back to your blog if that's ok.
Leave me some comment love all! Madcapfrenzy/Morgaine Ford-Workman. Theme images by andynwt. Powered by Blogger.